P.O. Box 10413                 8128 Kokoma Dr.
RaCon 6805 is a multi-function radio controller designed especially for amateurs. It's a CW keyer, FoxBox for T-hunting, DTMF decoder, DTMF controller, and an Auto-pager all-in-one. Thanks to the heart of this project, the Motorola MC68HC705C8, a.k.a. 6805, all these functions and many others can be programmed into a single 40 pin integrated circuit. The 6805 has 8K of ROM for storing the programs, 300 bytes of RAM for storing personalized data, 31 bi-directional I/O pins for interfacing with the other components on the board, and runs on 5 volts with a 4 Mhz crystal. All chips are personalized with the owners' callsign burned into the chip's memory. Combine the 6805 with serial interface, radio interface, cross-band repeat module, DTMF decoder, power regulator and you've got yourself a RaCon 6805 Radio Controller. T-Hunts are fun, but talking continuously for 4 hours as the hidden transmitter can be a real drag. The FoxBox Controller provides your radio with tone sequences, PTT control and CW ID. There are several tone sequences and duty-cycles to choose from, and you can even talk through the hidden transmitter if you are using a dual-band radio. CW ID occurs at least once every 10 minutes, so the FoxBox can be left to run for hours on end. It can be remotely secured to prevent others from controlling it. Callsign, tone sequences, duty cycles, password and CW speed can be reprogrammed easily with DTMF tones. The DTMF decoder will decode any incoming DTMF tones to your computer for easy viewing or logging. Simply patch your radio's speaker output to RaCon's 1/8" audio jack and any DTMF tones received will be displayed on your computer monitor. This feature can be used to verify proper operation of DTMF transmitters, to log DTMF activity, or to remotely control your computer using DTMF tones. The DTMF controller provides a simple way to remotely control external devices with DTMF tones. By mating a relay card or CMOS compatible switch to RaCon's data port, simple DTMF sequences provide you with complete control of 8 independent functions. You may wish to use this feature to control equipment in your ham shack, car or remote radio site. RaCon can also transmit a bit status report using low and high tones followed by CW ID. The CW Keyer, when plugged into your computer via the serial port and your HT via the radio port, will send Morse Code over the air in MCW (Modulated CW) form. RaCon 6805 manages the pushing and releasing of the PTT at the proper times, so all you do is type on your keyboard. A menu allows users to select both character and word speed independently (Farnsworth). This would be useful for sending practice Morse code exams over the air, or improving your code speed by engaging in an MCW QSO with a friend. The Auto-pager configuration provides a convenient way to page your pager-equipped ham friends by radio without using an autopatch. Connect RaCon 6805 to a receiver and an external modem at your home. By transmitting the proper DTMF codes on simplex or a repeater (with trustee's permission), the modem will dial one of four pager numbers and send one of four messages. By connecting RaCon's serial port to a computer, pager numbers and messages are configurable. This feature can be used to expedite RACES, ARES, Red Cross and other emergency call-outs. 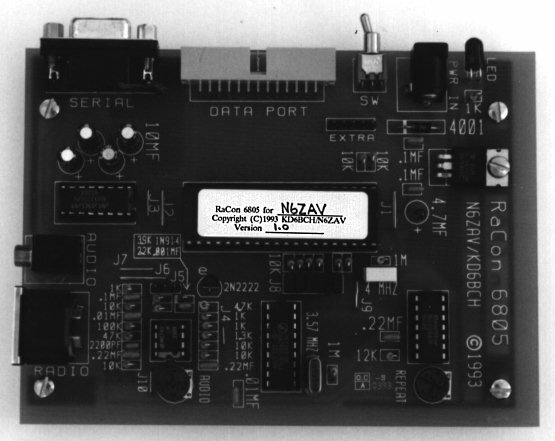 RaCon 6805 has a 16-bit data port for hardware upgradability. The kit comes complete with all parts necessary to build the board minus chassis. It runs off any 7-35 VDC source and only draws 30 ma., so a 9V battery will work, or better yet, (8) AA cells. Assembly time should be less than two hours. All components should be inserted from the component silk-screen side of the board. The integrated circuits are static sensitive. Use standard precautions when handling these devices. Diodes, transistors, some capacitors and all integrated circuits are polarity critical. Be sure to orient these components properly prior to installation. A low wattage soldering iron (15-25 watts) with a small tip is preferable. You will also need some thin solder, small diagonal cutters and a pair of needle nose pliers. See PARTS LIST for resistor color code and capacitor identification information. Trim leads of components AFTER soldering in place. Silkscreen values ending with "MF" are capacitors and those ending with "K" or "M" are resistors (".01MF" is a capacitor and "10K" is a resistor). Insert and solder into place all 5 integrated circuit sockets. Be sure to install with orientation notch as indicated on silk-screen. This notch indicates where pin 1 of each IC will be plugged in later. Install radio interface 5-pin DIN jack. Install 1/8" audio jack. Use lots of solder with minimal flow into jack. Install serial interface DB-9 jack. Be sure to solder in strain relief posts as well. Install 26 pin data port. Install DC power jack. Use lots of solder with minimal flow into jack. Install J8. These are gold posts in a 2 x 4 array and a 1 x 2 . Be sure to solder in the short side leaving the long side on top of the board. Install J5. This is a gold post array 1 x 3. Install EXTRA gold post array 1 x 5. Bend the leads of the power regulator 7805 (or 78M05) 90 degrees down, so that when installed, the mounting hole aligns with the circuit board hole. Install metal side down. Secure the 7805 in place with 4-40 x 1/4" screw, washer & nut. Install the 4 Mhz ceramic resonator. It is a small light blue rectangular device with three pins. Polarity does not matter. Install the 3.579545 Mhz crystal. Polarity does not matter. Bend the leads of the 2N2222 (or PN2222) transistor so that it will install correctly when you match the flat side with that indicated on the silk-screen. Bend both leads of the red LED 90 degrees approximately 0.10 inches down from the LED. Be sure the flat side of the LED is towards the power-in connector. Install so LED is laying on the board. Install 4.7mf capacitor above microcontroller paying special attention to polarity. Bend leads on (4) 10mf capacitors to 0.2 inch spacing so they will match hole spacing in board. Install near serial interface paying special attention to polarity. Bend leads on diode 1N4001 to match holes in board. Install with stripe oriented as indicated on silk-screen. Bend one lead of diode 1N4148 (or 1N914) 180 degrees and install vertically onto board where 1N914 is indicated. Be sure to match stripe with that indicated on silk-screen. Bend one lead of each resistor 180 degrees and install vertically onto board as indicated on silk-screen. Polarity is not a factor. DO NOT INSTALL the 1K resistor that is next to the 4.7 K resistor. This resistor is not required. See PARTS LIST for color code information. Install remaining capacitors as indicated on silk-screen. Polarity is not a factor. See PARTS LIST for capacitor identification information. Using new insulated wire or excess leads from resistors, install wire jumpers at J1, J2, J3, J4, J6, J7, J9, J10 on top (component) side of board. Inspect the board for solder bridges or poor solder connections. Prepare power and interface cables as required by desired applications. See INTERFACE CABLES for more on this. Do not insert any integrated circuits until the following check-out procedure is complete. Using an ohmmeter, test the resistance between pin 1 and pin 2 of 7805 (left and center pin as viewed from component side). The reading should be above 1M ohm. Also check between pin 2 and pin 3 (middle and right pin) . The reading should be above 800 ohms. This is to verify that no short circuits exist between +Vcc and ground and between +5 volts and ground. Apply +7 to +35 volts to the power-in connector. Remember, the center contact is +V and the outside contact is ground. See INTERFACE CABLES for details. Turn on the power switch. Verify LED operation and test for +5 volts at pin 40 (top right as viewed from component side) of the microcontroller socket. If these tests were successful, turn off power switch, remove power source and insert all integrated circuit into their proper sockets. Use static precautions. You may need to bend the leads in slightly to align the IC pins with their sockets. Remember to orient these properly! Pin 1 is usually indicated by a notch on one end. Align this notch with the notch in the IC sockets previously installed. Double-check for correct orientation with the silk-screen print-out included. ICs installed backwards may be permanently damaged. Triple-check orientation of integrated circuits. Quadruple-check orientation of integrated circuits. Build interface cables as necessary for the features you wish to utilize. To adjust the proper AUDIO output level, connect the Radio Interface cable (see below) between RaCon and your transceiver. Begin FoxBox mode, transmission #3, and adjust the AUDIO pot so that the level received on a second receiver is comfortable. During the OFF times, switch the second receiver to a local repeater and compare this level to that previously observed and verify similar levels. To adjust the proper REPEAT level, select the audio repeat mode (see below), and adjust both receiver volume and RaCon REPEAT pot for a comfortable level on a third radio. Verify that the DTMF decoder is still functional at the new receiver volume level. RaCon uses a coaxial power connector, with a inner diameter of 2.5mm and an outer diameter of 5.5mm. The positive lead (+) must be connected to the inner (center) conductor and the negative lead (-) to the outer conductor. These connectors are available from Radio Shack (part number 274-1573). A 9-volt battery works nicely for many hours (draws less than 30ma). RaCon has a DB9 female serial connector for interfacing with computers. It is configured as a DCE (modem), so connection to a computer with a DB9 male serial port requires a 9 pin male to 9 pin female cable. If your computer has a 25 pin serial port, either use a 9 to 25 pin adapter or build a 9 to 25 pin cable. Note that only three lines are used on the port; data out, data in, and ground (pins 2, 3, and 5 on the DB9 and 3, 2, and 7 in the DB25). Cables which have more than the required three conductors will also work fine. When using the Auto Pager feature, a null modem adapter or cable is required. You may wish to use the cable outlined above and add a null modem adapter, or build a new serial cable similar to the one above, but with the wires terminating at pins 2 and 3 reversed on one side only. Note the unusual sequence in which DIN pins are numbered. The radio side of this cable varies between radio manufacturers. Consult your radio owners manual for details. Use a 26 pin female ribbon cable connector with ribbon cable to mate with RaCon's data port. You may wish to build your own cable or buy a pre-built one. Here is a table of signals and their corresponding pin numbers. Pin 1 is usually marked on both connectors with a small triangle. All signals may not be used at this time. RaCon 6805 has several operating modes. Mode of operation may be selected in one of three ways: jumper shunt selection, DTMF selection, or serial selection. " X " means that jumper is present. Set jumper J8 A-D for desired power-up configuration. Jumper J8-E is used within some of the features, such as the FoxBox change callsign, sequence and transmission. For DTMF or serial mode selection, remove jumper shunts A-D. This is useful while experimenting with multiple modes because it does not require repeated access to jumper J8. For single mode usage, you may find that mode selection using jumper J8 is more convenient because it does not require a DTMF or serial command upon power-up. To operate under a different mode, power must be cycled before the new mode can be selected. The serial interface protocol is 1200 baud, 8 data bits, 1stop bit, no parity, full duplex (8N1). The output is readable ASCII form, and can be viewed with any terminal program software. From the serial or DTMF feature selection mode, a menu will appear as well as a report of the pre-programmed callsign and password. Jumper J-5 is used to select the resistance required between MIC and GROUND to activate PTT. The FoxBox mode allows for unattended transmission of a radio connected to RaCon 6805's radio interface port. These transmissions have been customized for use by a hidden transmitter during a Transmitter hunt. RaCon comes pre-programmed with many choices of tones and duty cycles for quick and easy operation. For more elaborate operations, many parameters can be programmed with DTMF tones. These include callsign, CW speed, tone sequences, duty cycles and security passwords. To use the FoxBox, build the Radio Interface Cable described above and use it to connect your radio to RaCon. If you are using a dual-band radio and wish to control RaCon on the sub-band, set your transmit frequency into the main-band and control frequency into the sub-band. Set the volume on the sub-band to a middle level. Set the volume on the main-band to zero. If your radio has a DUPLEX option (to allow sub-band reception during main-band transmission), be sure to turn it on. If your radio cannot receive sub-band audio during main-band transmissions, you will not be able to control RaCon while it is transmitting. To enter to the FoxBox mode, insure that Jumper J-8 is set properly, turn RaCon's power switch on and verify that your radio's power is also on. The FoxBox will wait for a command. ON, OFF and DUTY cycle times are approximate. Begin Normal Transmission - "1 thru 9"
This command causes the device to begin transmitting a specific series of tones. If the device was already running another transmission, that transmission will stop and the newly chosen transmission will begin. Begin Audio Repeat Transmission - " * "
This command causes the device to stop any currently running transmission and switch to the audio-repeat mode. This allows any audio entering though the radio port's speaker line to be sent out the radio port's microphone line. Using this feature, RaCon 6805 will act like a repeater, re-broadcasting the received audio on the transmitting radio. This transmission runs indefinitely until a new command is entered. When using a single band radio as the fox, this feature should be disabled because you will have no way to control RaCon once audio-repeat is started. See jumper J8 setting in MODE SELECTION chart for single band operation. Stop Current Transmission - " # "
This command causes the current transmission to be terminated immediately. If no transmission is running, this has no effect. One Shot Command - " A "
Normally, transmissions have a period of ON AIR time followed by a period OFF AIR time, which repeats indefinitely. The One Shot command causes the transmission to terminate after the next OFF AIR time. If no transmission is currently running, this command will take effect on the next transmission to be started. Change Parameter Command - " C<parameter><data>#"
This command is used to program any of the adjustable parameters. The syntax is "C" followed by a parameter identifier <A,B,C,D,*> , the parameter data and terminated with "#". There must be a jumper shunt on jumper J8-E to enable this command. Change Programmable Sequence - " CA<speed><tone sequence># "
This command allows you to create your own unique tone sequence. To program, enter "C" "A" then a tone speed (1-9), followed by up to 35 tones (1-9,0,A,B,C,D,*). Speed "1" is the slowest, "9" the fastest. The frequency of the tone choices from lowest to highest are 1,2,3,4,5,6,7,8,9,0,A,B,C,D. Use the " * " key to program silence within the sequence of tones while maintaining PTT. Here is an example of a proper sequence programming string: " CA 9 123**456**789**# ". To play the programmable sequence, select transmission #2. Change Programmable Transmission - " CB<sequence string># "
Use this command to custom program Transmission #2. A transmissions is just a set of sequences. Use the sequence chart below to select the ingredients for this programmable transmission. This should give you the versatility necessary to create countless unique transmissions. To program, enter "C" "B" followed by as many as 32 sequences from the sequence chart and end programming with "#". Here is an example of a proper transmission programming string: " CB 2 2 2 2 9 2 2 2 2 1 9 # ". Change Code Speed - " CC<speed># "
This command will set the Morse code speed of the CW id. The speed parameter must be a number between 1 and 9 and represents Farnsworth speeds of 5,7,9,11,13,15,17,19 and 20 words per minute respectively. For example, to set the CW speed to 13 words per minute (Farnsworth), enter " C C 5 # ". Change Password - " CD<new password># "
Each RaCon comes factory programmed with an unsecure password. You may select a new password with the change password command. The syntax is " C D <new password> # ". The new password may consist of up to eight (8) DTMF keys excluding the "#" key. For example, "CD007 # ". Change Callsign - " C*<data># "
This command allows you to change the pre-programmed callsign. After entering " C * ", enter the callsign in the format below, followed by the "#" key. You may find this table easier to remember if you visualize a touch-tone telephone and the letters associated with each key. Note: Q, Z, SPACE, punctuation and prosigns are not represented on normal telephones but are available. Note that each of the keys (1-9) has four (4) symbols associated with it. The code for any symbol is the associated key followed by "A,B,C, or D" to identify it's position on that key. Numbers are entered with only the digit. For example, the callsign KD6BCH would programmed as follows: " C * 5B 3A 6 2B 2C 4B #". Secure FoxBox Command - " D "
This command will secure RaCon and prevent further DTMF control. To unlock, enter your Unsecure Password. Your pre-programmed password can be found on the opening menu when connected to a computer in the DTMF/serial selection mode. Your password can be changed using the Change Password command ("CD") above. This feature provides a convenient way to display and log DTMF activity received from any audio source. To use the DTMF decoder, build the Serial Interface Cable described above and use it to connect your computer terminal to RaCon. You will also need to get audio to either of RaCon's audio input ports. One is the 5 pin DIN Radio Interface Port which requires the Radio Interface Cable described earlier and the other is the 1/8" Audio Jack which requires a cable connected to your audio source with a 1/8" male plug on the other end. The serial interface protocol is 1200 baud, 8 data bits, 1stop bit, no parity, full duplex (8N1). The output is readable ASCII form, and can be viewed with any terminal program software. By using custom software, it is possible to have the computer react to the incoming DTMF characters. This feature provides the ability to control devices remotely by DTMF. To use the DTMF controller, you will need to get audio to either of RaCon's audio input ports. One is the 5 pin DIN Radio Interface Port which requires the Radio Interface Cable described earlier and the other is the 1/8" Audio Jack which requires a cable connected to your audio source with a 1/8" male plug on the other end. You will also need to build an interface between RaCon's CMOS data port and the external device you wish to control. Relays may be necessary for high current devices, but transistors, power MOSFETs or opto-isolators may be suitable for many applications. DTMF commands are used to change the status of the CMOS output lines X1 thru X8 on the data port. Commands are in the form <bit><command> where <bit> is the bit number to act on, and <command> is what should be done to that bit. Bits are in the range of 1 to 8, and commands are " *, #, A, B ". " * " turns the bit ON (high), and '#' turns the bit OFF (low). "A" toggles the status of the bit, so if it was ON, it switched to OFF and vice versa. "B" will cause the bit to turn ON momentarily and then turn OFF. Thus an example command would be "2*" to turn bit 2 ON or "5A" to toggle the status of bit 5. If a transceiver is connected to RaCon's Radio Port, the status of the 8 data bits are transmitted as an audio sequence upon start-up or any valid command. The audio sequence will be 8 tones of high or low pitch, each one corresponding to the status of a bit. A high tone indicates that the corresponding bit is ON, and a low tone indicates that the bit is OFF. The first tone corresponds to bit one (X1). To report the status of all eight bits without changing their state, enter " C ". To secure the controller, enter " D ". To unsecure, enter your DTMF password. Refer to INTERFACE CABLE section for data port bit assignments. The CW Keyer feature is used to transmit Morse Code from text entered on a computer terminal. The PTT line will be automatically controlled as required. To use the CW Keyer, build the Serial Interface Cable and Radio Interface Cable described above, and use them to connect RaCon to your radio and computer. Configure your terminal program to 1200 baud, N, 8, 1. Once you have entered the CW Mode, you should be able to generate Morse Code by typing on your terminal. A menu is available to configure several options. This menu is accessed by pressing the <esc> key on your terminal. From this menu, the character speed and spacing are independently adjustable. RaCon's ECHO parameter along with your terminal program's LOCAL ECHO parameter determine when typed characters are displayed (i.e. as they are typed versus when they are transmitted.) The FLOW parameter is used to enable/disable software handshaking. This can be useful when sending large ASCII files to prevent dropped characters due to buffer overflow. Both upper and lower case are valid. The following table maps procedural signs to keyboard equivalents. The Auto Pager features provides a convenient method of paging when a telephone or autopatch is not convenient. To use the Auto-pager, build the RaCon-to-modem cable described above and connect RaCon to an external 1200 baud (or faster) modem. You may wish to use the RaCon-to-computer cable, but be sure to include a null modem adapter. You will also need to provide RaCon with receiver audio via the Radio Port or the 1/8" Audio Jack. You should place a shorting shunt on jumper J8-E to enable RETRIES. RaCon will make 4 attempts at placing the page. The <initialize> character is '#' for normal operation and '*' for page-back mode. The <parity> is for security. It must be set such that the sum of the <to>, <from>, <message>, and <parity> numbers all sum to a multiple of ten. The <to>, <from>, and <message> fields represent data stored in RaCon's RAM. For example, if Byon (person number 1) wants to tell Marty (person number 2) to meet on 146.565 (message number 3), he would send "#2134" which can be viewed as "Marty (2), meet Byon (1) on 146.565 (3)". Notice how the parity is chosen to be 4 because the 2, 1, and 3 sum to 6, an additional 4 is needed to make the total sum a multiple of ten. There are two methods to verify that a proper page sequence has been received. The page-back mode will page the <from> station immediately after paging the <to>. To use the page-back mode, initiate the page with a " * " rather than a " # ". The other method requires that a transceiver be connected to RaCon's Radio Port. Upon receipt of a valid page command, RaCon will transmit your callsign in CW. Before using this feature, you must program the desired pager numbers and messages into RaCon's RAM. Attach RaCon to your computer (via the RaCon-to-computer cable), select Auto-pager mode (by jumper J8 or serial command), then press <esc> on your computer terminal to bring up the pager edit menu. After you have entered the desired information, press <esc> to exit the menu. Without disrupting power to RaCon, connect to modem using the RaCon-to-modem cable . When installed properly, a valid command should cause the modem to go OFF HOOK (dial tone), dial the pager number, wait a few seconds, send the message, and hang-up the phone line. A 9-volt transistor radio battery makes a good power source since RaCon only draws 30 ma. You may wish to install one inside the chassis as either the primary or back-up power source. If connected as described below, you will be able to remove external power and still retain any user programmable parameters. Connect the positive lead of the 9-volt battery through an additional rectifier diode to the cathode of the 1N4001 diode on RaCon. Metal or plastic chassis may be used, although a metal one may provide better RF shielding. Since RaCon has connectors on two adjacent edges, be sure to select a chassis that is compatible with this configuration (U-shaped chassis may not work well). Do not connect audio sources to both input jacks (audio in & radio port), as they are directly connected to each other. If you are having PTT failure, verify correct J5 setting for current radio type. When selecting mode by DTMF, be sure to pause a few seconds between power-up and mode command as RaCon is busy sending the opening menu to the serial port. The default CW speed is 17 wpm. Callsign, Sequence #2, and Transmission #2 can contain up to 35 characters, tones and sequences. You may wish to program a message along with your callsign, such as "OC RACES T HUNT - KD6BCH / N6ZAV." Audio Repeat will run continuously until commanded to stop. When unsecuring the FoxBox, precede your password with a " # " to clear out any other entries (i.e. # 6805). Jumper J8-E must be shorted with a shunt to allow any user programmability. Monoband operations can be more secure by selecting an ODD SPLIT on your hidden transmitter. Unwanted commands coming through on the hunt frequency will not be heard. " A " must precede the transmission number to activate the One Shot command during monoband operation. Hunters may become confused if you change the audio tones mid-hunt (especially if there are multiple T's). Two FoxBoxes can be programmed to operate simultaneously without interfering with each other. Program each with similar transmission times and 50% duty cycles. Begin transmitter # 2 after #1 completes a transmission. If you have problems decoding, verify that the volume level of your receiver is not too high or too low. Be sure to check all 16 DTMF tones. Since RaCon is busy attempting to report bit status after any command, be sure to wait a few seconds prior to sending additional commands. Bit status is also reported via the serial port. The security password is programmable for this mode. Backspace is supported on condition that the character you are attempting to erase has not been transmitted. If your screen fills with triangles or other funny symbols, try disabling FLOW with the on-screen menu (press <esc>). Due to slow key-up times on some transmitters, you may want to begin each transmission with a couple SPACES. The default CW speed is 17 wpm Farnsworth. Speed choices are between 5 and 25 wpm and word speed may never exceed character speed. Farnsworth may be disabled by selecting common word and character speeds. Jumper J8-E can be removed to disable RETRIES when RaCon detects an unsuccessful page. Rather than sharing the code scheme with all users, you may with to advise certain users of specific paging commands only (i.e. " Joe, key in #1216 and I'll come up on 447.000 " ). Your modem must be capable of returning result codes (most 1200 baud modems are).